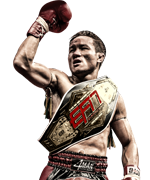 Born in the muaythai hotbed of Isaan in the Northeast of Thailand and the son of a successful muaythai fighter, Changpuek always had muaythai in his blood. His first competitive fight was at a local temple fair in his native Isaan when he was 13 years old. As he was big for his age, when he was still 13, Changpuek would often fight against opponents who were in their mid and late 20s. Training out of his father’s gym, he gained a lot of valuable experience on the unforgiving Isaan circuit before moving to Bangkok where he soon earned a reputation as a tough fighter with a big heart. Chanpuek now trains at the Elite Fight Club gym in Bangkok and is a member of the Thai TVC team.